Strength training exercises help you build strong muscles that help support and protect your joints. Strength training, whether done at home or at the gym, is an important part of managing arthritis. One day when I woke up in morning, I felt slight soreness and stiffness in my left knee. After some time the soreness and stiffness was gone. Days passed, and one day when I was climbing stairs I noticed a little pain in my left knee. I did not want to miss the gym. So, next morning I was in the gym at my usual time at 5.30 a.m. But, I was in a dilemma should I do my strength training such as leg curls on a weight machine? I researched a lot and talked to many experts and doctors about the above sudden cropped up problem. The conclusion was that strength training could help me to get out of this predicament. I have been practicing strength training for the last 6 months and it has helped me a lot. In this article, I will share with you the tips about how I have managed my knee problem successfully. 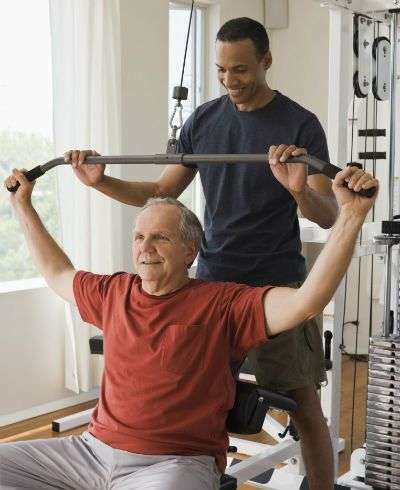 Strength training is good for everyone, even in the old age. It’s particularly useful for people with arthritis. When done correctly, as part of a larger exercise program, strength training aids, support and protect not only joints, but can also ease pain, stiffness, and possibly reduce swelling. Yet, the thought of initiating a strength-training program can be scary to those having arthritis. Although it may appear conflicting, strength training (also weight training or weight lifting) has been found to reduce pain and improve strength and function of the joints for the arthritis sufferers. 1.Aim for doing some strength training and flexibility activities, which enhance range of motion. Also include some aerobic activities, which avoid further stress on joints (such as water exercise or the use of elliptical machines). Note: If you intend to start availing the benefits of strength training, the great first step is to work with a physiatrist, physical therapist, or certified personal trainer who has experience working with people who have arthritis. Ask him to design a program particularly tailored to your condition and your affected joints. This is the best approach to make sure you’re proceeding safely and protecting your joints as you strengthen them. 2. Schedule your workouts for times of the day when you are least likely to suffer from inflammation and pain. Avoid exercising when stiffness is at its worst. For example if you have stiffness in the morning, avoid strength training then. 3. If you are suffering from rheumatoid arthritis or any other form of inflammatory arthritis, make sure to warm up for few minutes up doing some gentle stretching before starting a strength exercise session. Also, stretch afterward and use ice therapy to ease muscle pain, if required. Always use slow movements during your warm-up, and gradually extend your range of motion. 4. If you are a rheumatoid arthritis sufferer, balance rest and exercise carefully. 5. As a general rule, you should avoid doing strength training that actively involves inflamed joints, at least until the inflammation eases. In some cases, water workouts may be a better option than strength training. 6. Workout within a comfortable range of motion. If an exercise or movement causes considerable pain, avoid doing it! Discuss your choices with a trainer or physical therapist. 7. To get the optimum benefit from strength training, try to do it 2 to 3 times a week for 30-40 minutes. For best overall results, try to include stretches and exercises for all major muscle groups, not just the muscles surrounding your arthritis-affected joints. As you go along, you can gradually increase the frequency and time, as you feel comfortable. 8. You don’t have to join a gym with weight machines in order to strength train. You can do exercises anywhere, even at home, using barbells, resistance bands, or even gravity. 9. A slight muscle soreness after weight training is normal, but a sharp pain is not. If an exercise or movement causes significant pain, avoid doing it. Caution: If you experience an arthritis flare-up, give strength training a rest until your inflammation subsides. In the meantime, you can focus on low impact activity like water therapy. Next articleIs Exercise Good For Knee Arthritis? Knowing the difference between types of pain is so important!